Information about BRIE in other languages will be available soon. At the moment you can find information about BRIE in GERMAN. 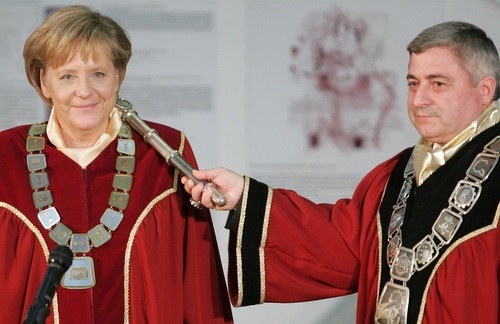 On Monday 11th October German Chancellor Angela Merkel has been granted a doctor honoris causa title by the Bulgarian Ruse University "Angel Kanchev". The title was presented to Merkel by the President of the Ruse University Hristo Beloev at a special ceremony in the National Archaeological Museum in Sofia, shortly before Merkel received the highest Bulgarian state medal "Stara Planina, 1st Degree." In her speech she highlighted the fact that University of Ruse is one of the best universities in Bulgaria with numerous relationsto international partners. The German Chancellor pointed out that the "Bulgarian-Romanian Interuniversity Europe Center" is a flagship project of Ruse university and she thanked especially all German, Bulgarian and Romanian partners supporting this project. At the end of her speach she thanked the faculty and administration of the Ruse University for traveling all the way to Sofia to present her with the doctor honoris causa title. She was originally supposed to travel to the city of Ruse to receive it but these plans were later dropped because of logistic problems.